I hope everyone had a good weekend and that you are ready for another challenging week ahead of you. 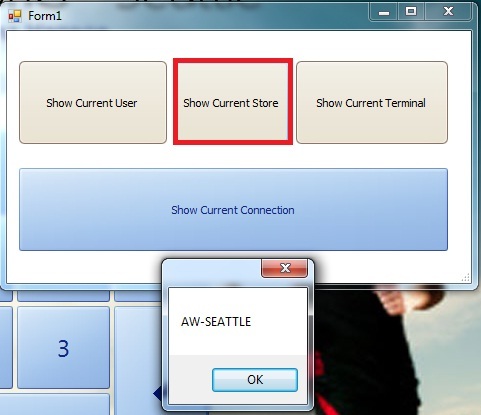 In this post I’m going to write about using the AX 2012 for Retail Application Settings. This is a dll that exists within the AX 2012 for Retail application folder, and that can be used to retrieve important and useful in-memory information such as the POS operator Id, Terminal ID, Store ID, Data Area ID, Store ID, among others. If we think about it, by using this dynamic library, we can minimize numerous trips to the database and therefore improve performance at run time. 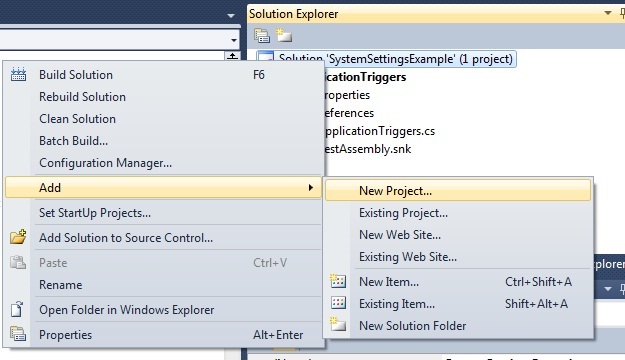 On this thought, this post will focus on a sample project that will retrieve some POS information through a windows form that will be opened when the PostLogon() event is fired. 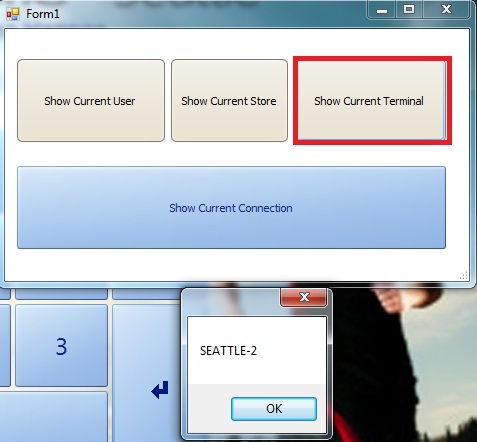 This means that when the Windows form opens, we’ll know who is logged in, the terminal and the store they logged in to. So, let’s start by setting up our project. 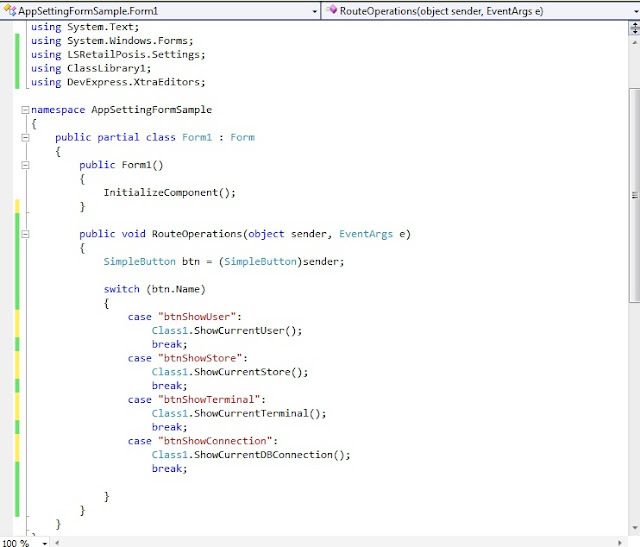 Please note that I made a copy of my POS application folder to play around, as our exercise will overwrite the Application Triggers dll and it will create a new dll that for our new form project. 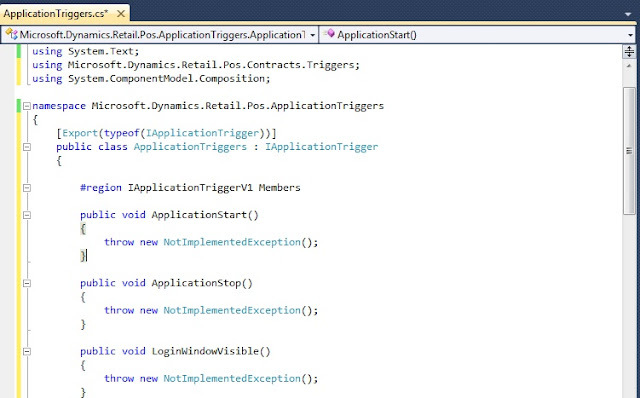 If you haven’t read my post on AX 2012 POS development - Application triggers I would recommend to read it before moving forward. 1-Create a new project, select Class Library and name it Application Triggers. 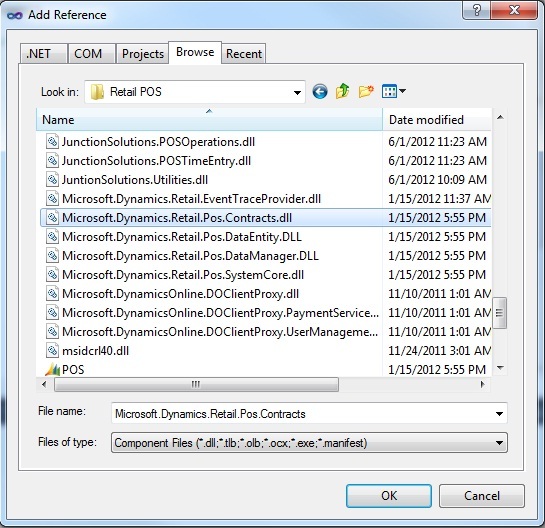 2-Add the Microsoft.Dynamics.Retail.POS.Contract.dll reference to the above project. 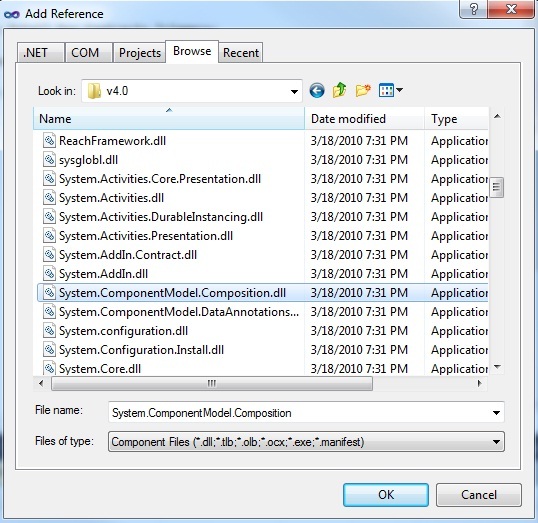 3-Add the System.ComponentModel.Composition.dll to the above project. 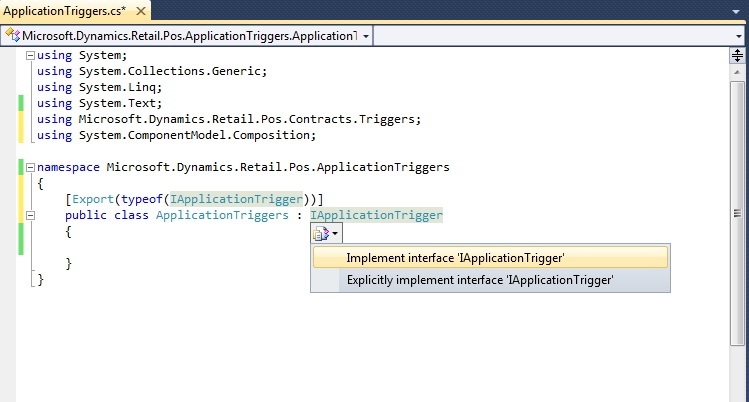 4-Open your code file and implement the IApplicationtrigger interface as shown below. 5-Make sure it looks like the following picture, and then delete the throw statements to avoid firing an exception at run time. NOTE: You can see a sample of this form below. 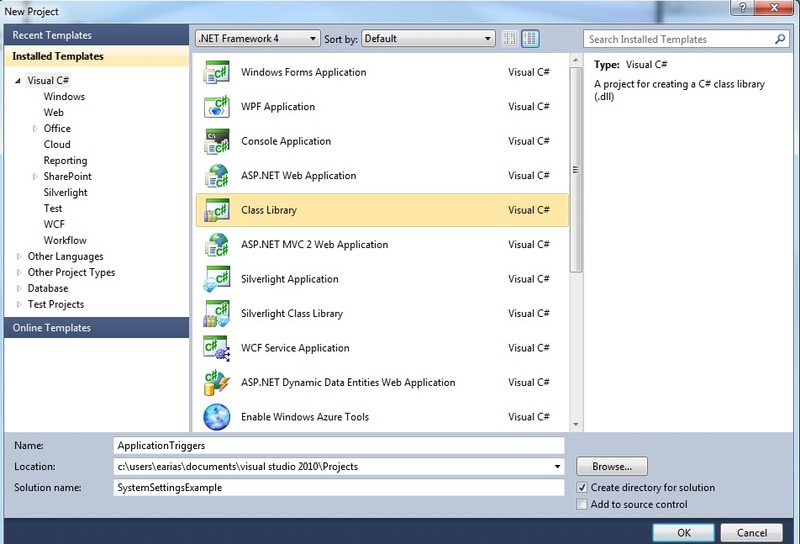 11-In your ApplicationTriggers Project, reference the System.Settings.Dll. 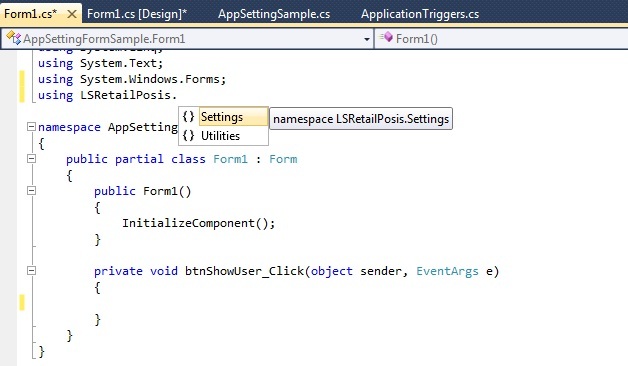 12-Add the namespace to your code (LSRetailPosis.Settings). 13-Add the following code to the class you created along with the form. Here we are using the ApplicationSettings dll to retrieve the information each button says it will retrieve. If you note, this is a really good and simplified design. Each of these calls does not fire up a trip to the Database and it just takes the data from memory, which makes the AX 2012 POS application really responsive. 14-In order to call our class and retrieve the information we need, we have to write some events for each button. Now, we need to go to each button properties’ Click() method and add the name of our button event handler in order for the event to work. 15-Run the solution and the AX 2012 POS application should be opened (Check my post AX 2012 POS development - Application triggers). Input your credentials. you should see the form you created. Click each button and you should see the following results. There is much more to cover on the AX 2012 POS System Settings, and I certainly encourage you to dive deeper into it as it is really cool and make writing code really easy and scalable. That’s all for now and keep checking back for my next post on Blank Operations and much more! Very good article, thank you very much, i have juste a remarque, you have miss to put the code to lauche the form. its working for me , tank you. yes yes i have'nt seen it, i have add this portion of code in my programme and it's working very nice, otherwise, i'm no trying to get à price list and to show it in a form. have you any idea about the function i have to call? There are different ways to do this. You can write a method in AX and call it from your POS as a dataset or something. 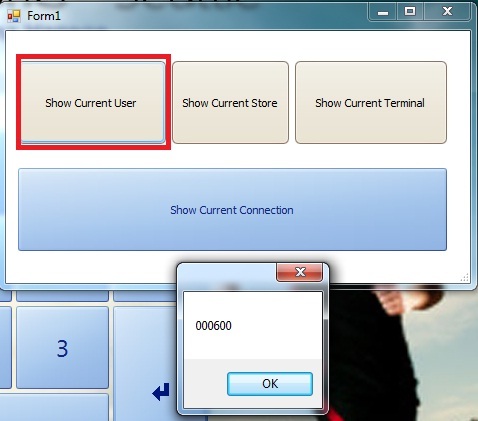 The other method would be to use the DataAccess.dll that it is within the POS app folder. With this dll you can query the POS DB directly. ANd you can just use LINQ and/or in-line sql statements. OKEY !! i'm gonna try it today and i will share the result with you !! thanks a lot !! today i succufly implement the function to get the PriceList of a product, and i have put the result in a forme, so when i select a product in the POS, the forme is shown and you get all the discount and the rules parametred on the product. i have used the ITEM Service with a function i desined to get information from The retail database. Now i'm gonna try to change the behave of the POS, so the OPERATOR would have the choice to use a SPECIFIQUE PRICELIST Or a DISCOUNT FORMULA from the form i have shown to him. That's nice work man! I would love to see the code you wrote to post it in my blog and share it with others if that's ok with you. Here is my Code !! in item.cs file i added this function !! Super Mohamed, thanks so much for sharing your code with us. Have a great weekend and I hope to hear soon from you! send me yours too :), have a nice day !! I am having some problems and I want to know if you can help me. I need to save the SalesPersonId for each transaction on the POS, I see that the saleLineItem already has the SalesPersonId. I want to use that field but something is missing. When the Operator introduces the first item, it displays a form with a numpad to enter the salesperson code, so what I want is to save that value on the RetailTransactionTable but it will not insert the transaction into the Table until the operator(cashier) close the sale. I do not know if you understand what I am trying to say. You will have to use a custom database operation for this. 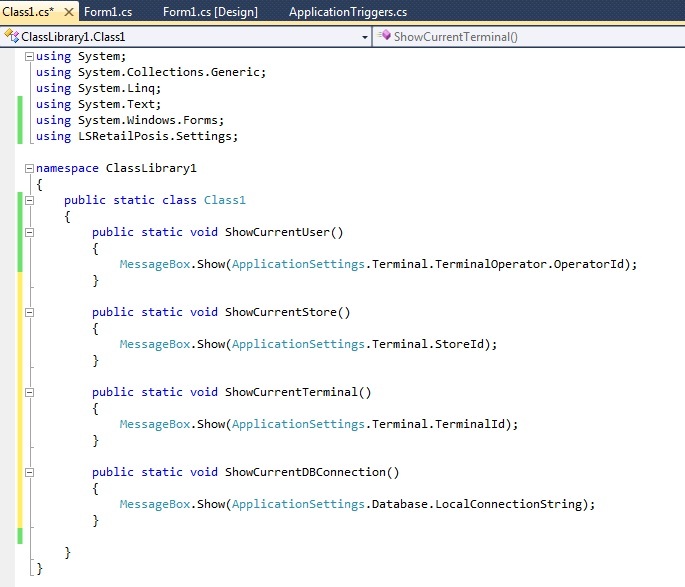 You can use the DataAccess.Dll and write data to this line at the time you want to and not when the transaction is done. You already know the line number and the Sales Person Code. I hope this helps. Let us know if you got it working and if thism post helped you, I would appreciated if you could share your solution with us. I'm working on POS customization and I'm trying to customize the Barcode Service, because we need to read several specific barcodes with their own barcode masks and we need to extract different information, so I want to add this new information as a new fields on the BarcodeInfo datatype, in order to use it on different methods on the service. Is there any way to override the BarcodeInfo datatype to do it? The only thing that comes to mind is that you would create as many as barcode masks as you need to fulfill your need. I'm not sure and I haven't worked with the barcode service and/or dll yet. Follow your articles about Retail, I almost control the POS, but I'm still stuck in the pull the transaction from Store back to Headquarter. It could get the transaction but not for my custom field in that table. My custom field showed in "Distribution locations" and match with Headquarter in "Transfer field list" of "Scheduler subjob". Is there any place for us to set up or define what field will pull back to the Headquarter? thanks for sharing but where Should I found the system.settings.dll or LSRetailposis ???? It is located in your POS directory (Located either under the Microsoft Dynamics AX folder, or the place that your admin put it). There should be a system dll there. Then you just add a reference to Visual Studio and also create a using statement. Hi, I was wondering if you know if there is documentation related to the "digital signing" for Ax 2012? I don't know about anything on that topic. Can you elaborate a bit more on what it is, so perhaps I know it by a different name? Hi, I am trying to insert data into RetailperiodicDiscount through code, Can you help me with the tables which i need to insert , as its an abstract table. I don't think this is an abstract table. There is no such thing as abstract tables in AX. Only classes can be abstract. The Table you mentioned is a real table and therefore to insert data look at the relationships, specially RetailDiscountValidationPeriod and PriceDIscGroup tables. I don't have any code that does this, but I would assume that AX provides a class to do so. The other alternative is for you to follow the logic on how AX does this if you insert a record manually. Just set a breakpoint. It has been fun following your blog. It would be great if you could help me in solving this issue we are having. We have added a few custom fields to the customer object in AX retail. We are trying to add these fields to the POS application and update the Transaction services accordingly. 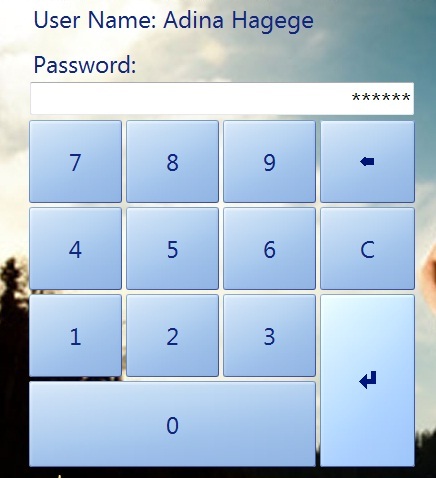 In the Transaction Services, we are planning to add code to update the new fields value with teh user input. 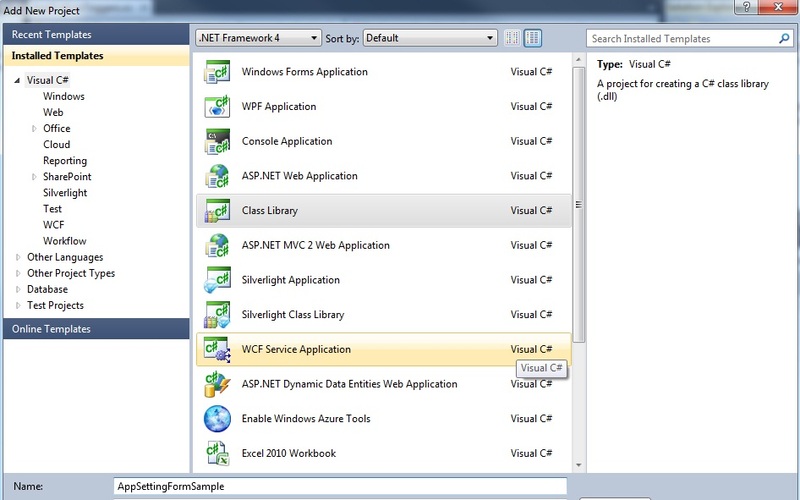 But we are not able to see the new fields that were added to AX in the Customer object. We also observe that the Transaction.dll and the Contract.dll are still not updated with the changes on the AX side. Is there a way we can update this DLL? Thanks for following my blog! What you want to achieve is actually simple. The following link will help you achieve adding custom fields to the customer object and I used this post for what I did in the past. We have tried the custom fields approach, but as I understand it, it can be created only for four specific areas - Totals Area, Billing, Receipts etc. It did not give an option to create a custom field for Customer. So how would you add a custom field for Customer record and update the transaction service to set the values for the correct customer field. After adding the custom fields, the Transaction DLL's were not updated and hence we are not able to set the values to the new fields. I am new to this and any directions from you would be of great help. In that case, shouldn't you modified the transaction DLL manually then? AX 2012 Retail has the SDK with all the dll's necessary to modify. 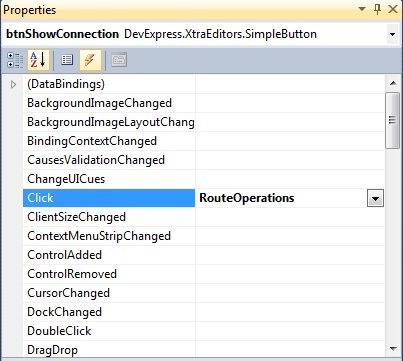 In this SDK you'll find the Transaction project that you can map to both the retail app and AX. Not sure how to actually do what you are asking, I did modified the customer DLL following the approach on the link, and for what I have seen, any other modification must be done directly into the SDK projects and then be redeployed back to the retail folder.